Spotify is a digital music service which allows users to access millions of songs; new and old alike. 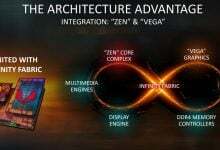 It has cross-platform compatibility i.e. Android, Windows, and Mac OS. 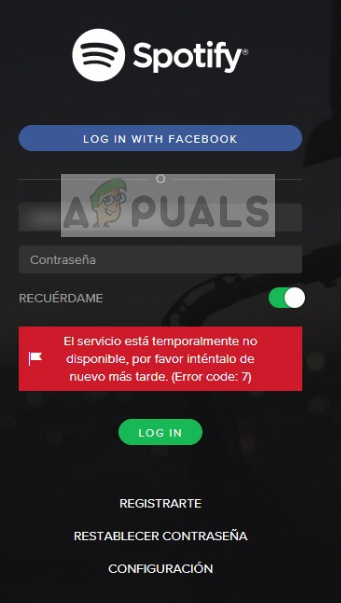 When trying to login to Spotify, users may be directed to Error Code 7 “SERVICIO ESTA TEMPORALMENTE NO DISPONIBLE, POR FAVOR INTÉNTALO DE NUEVO MAS TARDE” which simply means Service is Temporarily Not Available. 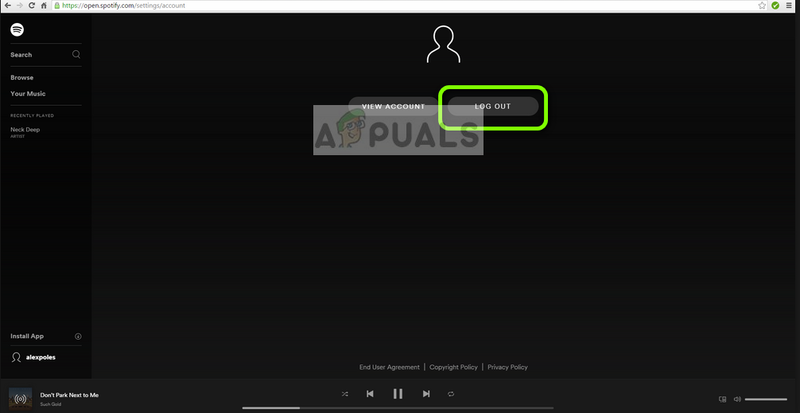 The error code 7 in Spotify occurs in almost all the platforms and is usually an indication that there is a problem with your network settings or there are some misconfigurations with your network in Windows. 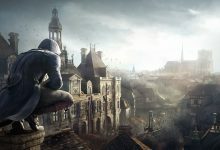 In this article, we will go through all the possible workarounds to fix this problem starting from the easiest fixes. What causes Spotify Error Code 7 ‘Service Not Available’? Browser data and cookies: If you are accessing Spotify using your browser (whether in Mac or Windows) and there is bad data stored, you can receive the error code. Account problems: We also came across cases where the login module was in a bug state and a simple re-login fixed the issue instantly. 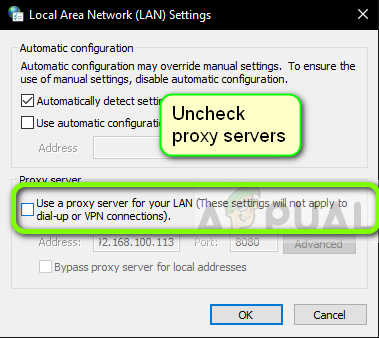 Proxy servers: Your network might involve proxy servers to work. This behavior is usually seen at organizations and it doesn’t seem to work well with Spotify. VPNs: Virtual Private Networks work as tunnels in the network people use them to browser content which is otherwise not available in their country. VPNs can also cause issues with Spotify as the application doesn’t work until certain parameters are fulfilled. Router: Since this error message is primarily related to the network, it is possible that your router is in an error state and not transmitting the network as it should. Before we move on to the solutions, make sure that you are logged in as an administrator. Start from the first solution and work your way down accordingly. VPNs and Proxy servers give flexibility to internet users. They can be used within an organization or for your personal use. After looking at several cases, we concluded that VPN and Proxy servers do indeed hinder Spotify. Some proxy servers are known to block several services by default (especially in organizations). Press Windows + R, type “inetcpl.cpl” in the dialogue box and press Enter. Now Internet Properties will be opened. Click on the tab Connections and then LAN settings. Now if you are using a proxy server, the field will be checked with the details inside. Uncheck any proxy servers if enabled. Now restart the application/webpage and check if the issue is resolved. If you are using a proxy server on your mobile when opening the Spotify application, make sure that you disable it. Same goes for VPNs. 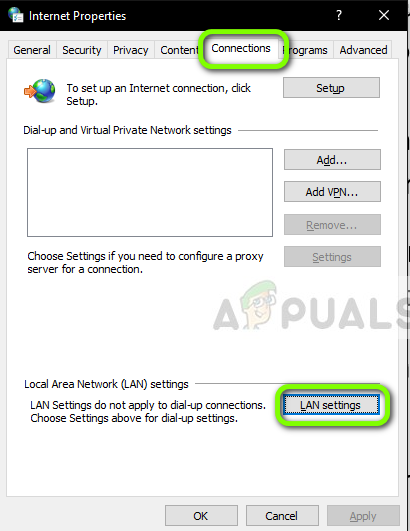 Disable every VPN from your computer and make sure that you connected to an open network. Internet connections in hospitals and organizations are not considered open as they always have some domains which are not accessible by the users. Routers are known to get into error configurations and don’t broadcast the network properly. These error states might occur independently or may occur due to some external event in the network. A simple restart of your router instantly reinitializes your temporary configurations and force the device to fetch new ones. Take out the main power cable of the router from the socket. Now, wait for around 3-5 minutes to make sure all the power has been drained completely. After the time has elapsed, re-plug everything back and then wait a few minutes so the network is broadcasting again properly. Now check the application in your computer/mobile and see if you can load the songs properly. Accounts problems are very common and can occur every now and then. 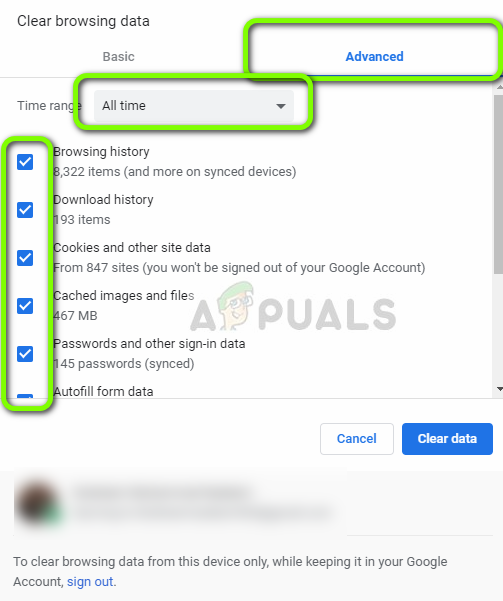 Account mechanisms are somewhat complex as they need to keep track of your active activity as well as make sure that it knows the number of devices from which the account is logged in from. Further synchronization is needed as well. If any of these modules stop working properly, Spotify might get in an error state and display a network error message. If you are using the mobile application, navigate to Your library tab present at the bottom left and then click Log Out when prompted. Similar steps go for the Desktop application. 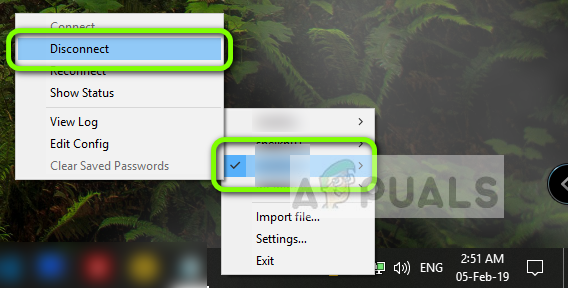 Click on the downward arrow present on the taskbar towards the right and select Logout. 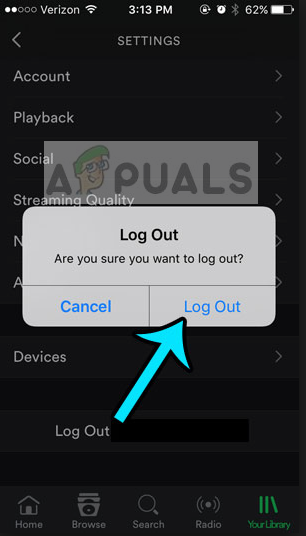 After you have logged out properly, re-enter your credentials and check if you are able to stream Spotify properly. Note: You can also try signing out from all devices and see if this works. Spotify might be one of the world’s largest online audio platforms but it doesn’t mean that it is doesn’t experience a little downtime every now and then. 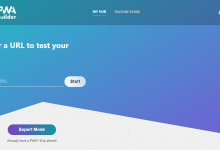 Downtimes are times when you cannot connect to some specific services or servers because either maintenance is underway or some issue has occurred at the server side. 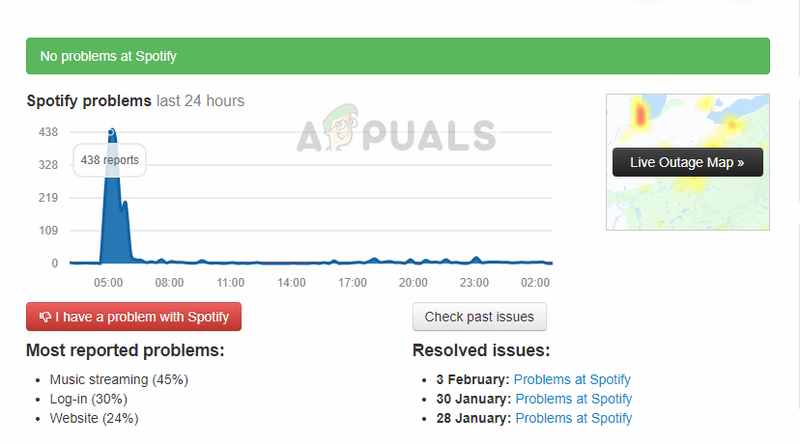 You can check several third-party websites and see if Spotify is down indeed. If you see a spike in the number of reports, it probably means that there is some issue. This will usually get fixed within a short period of time. If the platform is down, come back later after a while and try again. If you are using Spotify website for streaming, it is possible that the browser has some bad data stored in your computer. This happens with browsers all the time and is perfectly normal. You need to clear your entire browsing data and see if this brings any improvement to the situation. Press Ctrl + Shift + Del from your keyboard while Chrome is opened. Select the tab of Advanced, select the time range as All time. Check all the items and click Clear data. Restart your computer properly and open Chrome. Try accessing the website and check if the issue is fixed completely. The method above is of Google Chrome in Windows OS. 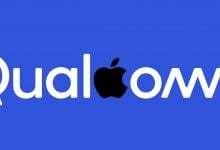 You perform similar steps for Mac OS as well. You can also open a terminal in Mac or Ubuntu and type the following command after clearing your browsers. Note: You can also try another workaround where the custom DNS server is removed from the computer so it can choose its own DNS server based solely on the network architecture.